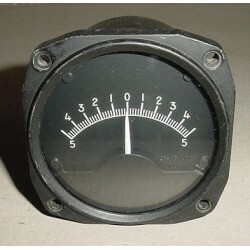 3 1/8" Grumman F9F Cougar Aircraft Pilot Directional Indicator, (it was used to direct the pilot to the target). Manufactured by Weston. Model 843. Type 5. P/N 162757. Grumman P/N 89SC1015-1. Very clean item. It shows very well and it would make an excellent show piece for the bookshelf in the office or home or just as a mock up panel item. 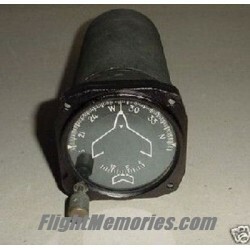 3 1/8" Grumman F9F Cougar Aircraft Pilot Directional Indicator, (it was used to direct the pilot to the target). Manufactured by Weston. Model 843. Type 5. P/N 162757. Grumman P/N 89SC1015-1. Very clean item. It shows very well and it would make an excellent show piece for the ..
Korean War Grumman F9F Panther Directional Gyro Indicator. P/N A1-63. Very clean item, very heavy also. It shows very well and it would make an excellent show piece for the bookshelf in the office or home or just as a mock up panel item.